I think a BR120 in Orienrot will be my choice for loco, along with the Broad red band/ narrow grey band wagon paint scheme. That way I'll have three different locos with three different paint schemes on display. Does that have the old DB logo or the new one? Hard to tell in the image for me. I have the Fleischmann BR120 in Orientrot with old logo and it could be bought pretty cheaply as it was part of a starter set. DM-Toys no longer has it listed, which is where I got mine, but you might be able to find one broken out from the set for sale. I also got lucky and got a Fleischmann BR120 in Traffic Red and new logo for a cheap price on eBay. But I have not seen it since for a good price. Does that have the old DB logo or the new one? Hard to tell in the image for me. I have the one with the new logo. I got mine as part of the Minitrix 11636 TALGO set with the Baden Württemberg ads. The one without ads is Minitrix 11416. I personally don't like the old logo on anything but TEE/Rheingold colors so all my collections (Interregio, Intercity orient red, traffic red, stripe) are all with new logo, so are the loco's. I think epoch V is a super fun theme as you can go quite crazy with colours. There are four IC colour schemes present during this era. Occasionally you also got one or two D-Zug (Ozeanblau/Elfenbein) or IR (Fernblau) coaches, and until 1993 even East-German DR coaches, mixed into a consist as well. I especially love the time around 2000 - 2004 when you could occasionally see three IC colour schemes in a single train. BR 103 - any colour (from 1990 until 2005) No push-pull operation! Another thing you want to pay attention to are the logos on coaches and locos. There was a period after Jan. 1994 when all three logos could be seen but this period was fairly brief as applying some logo stickers was probably not such a hard task back then. This site has a slightly better picture. And some German for you to practice on. You can just make out the serif type face in the logo. I have the one with the new logo. Interesting. Is yours Orientrot with new logo? They really were switching things up like crazy there for a while. I generally like san serif typeface better myself. But I love to see the gradual transition, through the Eras. It's like watching a train evolve. First color change/logo same then slight color change/ new logo. I think I'll hunt down a BR120 in Orientrot with new old logo. You mean the ICE colors on IC locos? I was in Germany last year and I saw few if any of those. Most IC locos were Verkehrsrot. I LOVE these ragamuffin trains. I'll be sure to run a few of them. I'll probably pick up a few IR coaches for just this purpose! Oh no, those colours mentioned above are for coaches. Those ICE colour locos are BR 146 used for IC2 trains. And the new Br 147 (Bombardier Traxx P160 AC3). Interesting. Is yours Orientrot with new logo? Yes. If you look up the minitrix loco I mentioned you will see it. So I've ordered most of the Era V IC train. Including a new BR120, and second hand Steuer wagon, two 1st class coaches (one compartment, one open plan), a restaurant car with pantograph, and three 2nd coaches (2 open plan and one compartment). I just need one more 2nd class compartment coach and a decoder. Unfortunately, I had to buy a second restaurant car as I could only find a well priced steuerwagon as part of a set of 4 cars. I'll have to sell the extra one. I'm now feeling an urge to get an Era V interregio train with an Orientrot BR 103. But I think I'll put that off for a while. Before that I'll probably have to get a new purpurrot/elfenbeim BR 103 to pull my Era IV IC train. The one I have now is old and a bit too slow for my liking. I'm finding this database to be very helpful for making sense of various German old and new releases. I couldn't help ordering an Orientrot BR 103 from the most recent Fleischmann release for a future Era V IR train. It'll sit without wagons for a while though. I need help with calculating the postage costs for a single n scale passenger wagon from Europe to the US. I was able to find my final epoch V IC car in an Austrian classified ad. Unfortunately, the seller isn't super enthusiastic about selling to the US as she doesn't know how to calculate postage costs from Austria to the US. Anyone know how I could calculate that? My Era V cars have begun to arrive. I realize I made an error with the 1st Class/2nd class balance. I planned on two 1st class, and four 2nd class coaches. But I forgot that the Steuerwagen is a 2nd class coach. That gives me a 5:2 ratio which I think is too high. I may buy another 1st class carriage to make it 4:3. There's also a Bord Bistro which seems to be "classless". I also managed to buy a "Kinderland" wagon for my IR train. British Rail inter-city trains used to be one first class, one buffet, and I think seven second class. As for 1st class / 2nd class balance, that depends where the train goes. For example, to the land of cheapskates (Netherlands) only 1 1st class would be in an 6-8 car train. To Graz (Austria) a normal composition would be 5 2nd class, 1 bistro, 2 1st class, 1 cabin car. As for the Bord Bistro (which in your set is actually a Bordrestaurant), yes, it is classless and the whole car is a restaurant car. These were (if I am correct) later retired and replaced by the Bord Bistro cars with "break your wrist when opening" doors because those have a smaller bistro area and the rest 1st class section, to increase capacity, since Restaurant cars are not used by too many people anymore (probably because of the skyhigh prices, food options on stations, and people preferring to gobble up their food on their seat to keep an eye on their belongings). Thanks. I didn't know that. But I think I'd have bought it and included it anyway, as I think it looks good. I'm having a hard time breaking out of my Fleischmann comfort zone. It's taken a while to work out their classification, and I don't know that of other companies at all. I'm a bit afraid of the noticeable wagon height differences between companies that I've heard of. Also, I think one company (arnold) makes some wagons shorter. So I'll need to get my numbers straight. But especially for IR wagons, Fleischmann are more rare and go for higher prices than other brands, so I may use the IR train at my comfort zone break-out. Thanks, I guess two 1st class coaches will do for now. Also, I think one company (arnold) makes some wagons shorter. That's Minitrix with their "Hobby" line. Arnold cars are superb, although the color is a bit different from Fleischmann IR cars. Though these are not supposed to run together so that does not matter. I'm having a hard time breaking out of my Fleischmann comfort zone. It's taken a while to work out their classification, and I don't know that of other companies at all. I'm a bit afraid of the noticeable wagon height differences between companies that I've heard of. As far as the normal EC cars go, there are no height differences. Some older cars do have height differences. Note that the "wide" doors and "narrow break your wrist" doors may look odd next to each other because of door length, but this is the case in reality also. But especially for IR wagons, Fleischmann are more rare and go for higher prices than other brands, so I may use the IR train at my comfort zone break-out. Be careful not to spend too much. 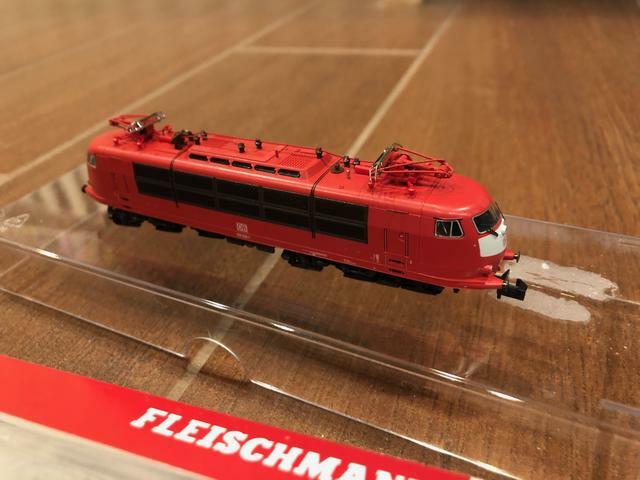 Fleischmann will re-release their IR wagons later this year. For such a short IC, two first class coaches are surely enough. The number of 1st class coaches in a train really has decreased over the years. I think the only ICs with more than one (or 1.5 in the case of a Bord Bistro) 1st class coach are those to/from Austria and Switzerland. Sadly, this database doesn't go back to era V.
The mix and length will have depended on era and route. Speaking entirely from unreferenced memory here, if it is correct but trains to/from London usually had more first class coaches, while those linking the provinces (e.g. northeast to southwest trains via Birmingham) would be more like the formation you describe. This little beauty arrived today. Eventually it'll pull my Epoch V IR train.